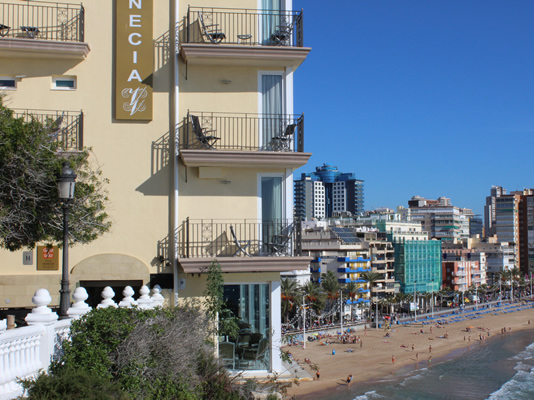 The Villa Venecia Boutique Hotel is an Adults Only property with an idyllic location right on the cliff tops of Benidorm's Old Town. 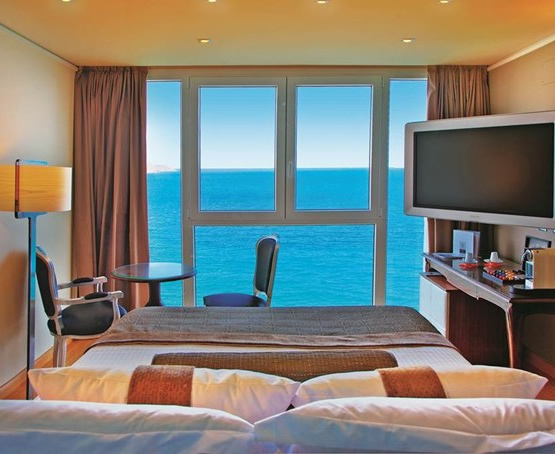 This lovely 5 star hotel has stunning views of the bay and presents a perfect choice for couples looking for a relaxing holiday. The hotel has an cosy rooftop bar and terrace, which is a superb place to soak up the atmosphere of this small, charming hotel. Only 50 metres from the Old Town with shops, tapas bars, restaurants and main nightlife; 2 kilometres from the new centre and close to transport links. The hotel has 25 guest rooms: 2 suites, 6 junior suites and 17 doubles, all standard rooms of this boutique hotel contain a double bed or two single beds, a modern bathroom with whirlpool bath and shower, hairdryer, safe deposit box, piped music, fridge and satellite television. There is individually controlled air-conditioning, ceiling to floor windows with panoramic views out to the sea, TV, alarm clock, coffee-maker and all have sea view. 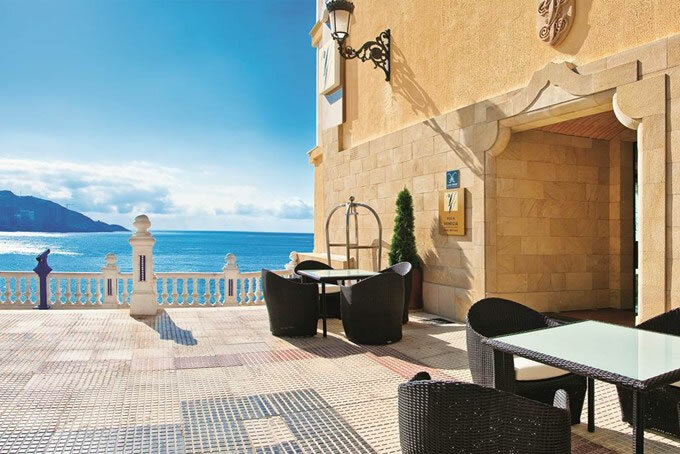 A buffet breakfast, lunch and dinner is offered in the panoramic restaurant Llum de Mar. 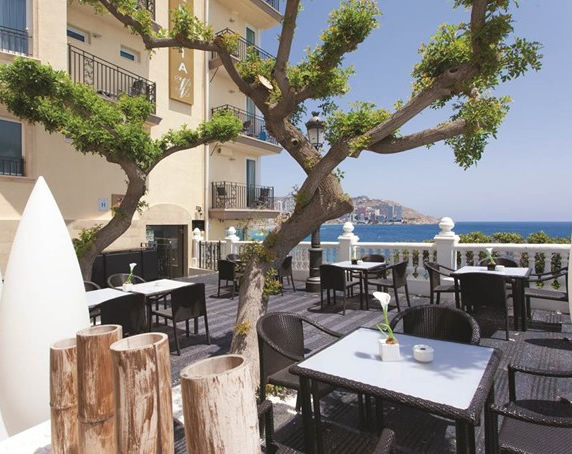 The air conditioned restaurant has a bar and an outside dining area and specialises in Mediterranean cuisine, and a terrace-bar with menus of the day. El Mirador showcases local produce and fine wines from around the country. The hotel also has a stylish cocktail bar with a seafront terrace. 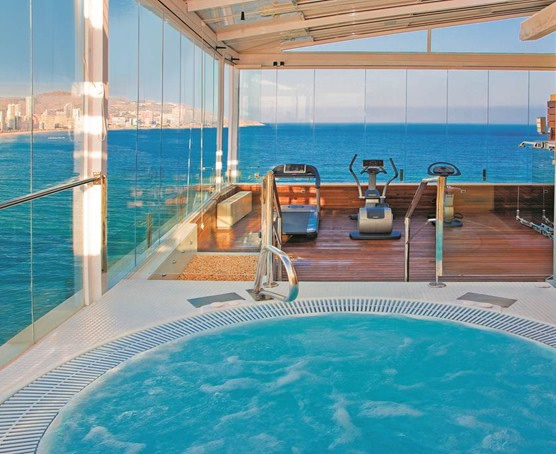 The hotel has a small rooftop swimming pool (Covered in winter), to aid your holiday relaxation there is an impressive SPA and Wellness Centre with excellent services including massage, Turkish Bath, sauna and Jacuzzi. The golden sandy Levante beach is just minutes' walk away, here you will be able to choose from a wide range of water sports. The Villa Venecia provides guests with facilities that include; a 24 hour reception desk with concierge service, currency exchange facilities, laundry facilities, safe deposit boxes, room service and restaurant, internet access, bar/lounge.